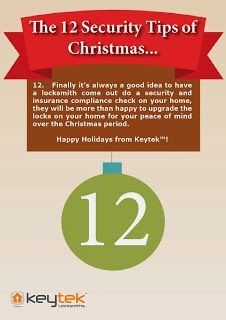 When thinking about the security of your home, it is always a good idea to think like a burglar! Look for any potential security risks that may be used to the advantage of a burglar i.e. spare keys under the mat. In a recent survey by Keytek® it was found that over 20% of Britons were still leaving spare keys hidden in an unsecure location such as under a plant pot in the garden. Read more about the survey results in a previous blog post here https://blog.keytek.co.uk/2013/09/over-20-of-britons-are-still-leaving.html. Many will advise against this including the charity Age UK who advise on their website not to leave spare keys in “obvious places such as under a flower pot or doormat or hanging inside the letterbox”. For a relatively small cost it is advisable to have a Key Safe fitted in a hidden location on the outside of your home by a 24 hour locksmith. A Key Safe is a secure box where you can safely and securely store your keys without having to hide them or to rely on a neighbour or family member to look after them. It is also advised that you don’t store any keys or ID documents near to a door or window that is accessible externally to minimise the risk of what is sometimes referred to as ‘fishing’. Insurance provider Aviva explains that “thieves will use props such as coat hangers and fishing rods to hook keys”. Key ‘fishing’ can be minimised not only by storing your keys away from any doors or windows but also by having a letterbox cage/guard fitted to your door by a locksmith. Letterbox brushes can be fitted to avoid a burglar seeing where your keys are stored.